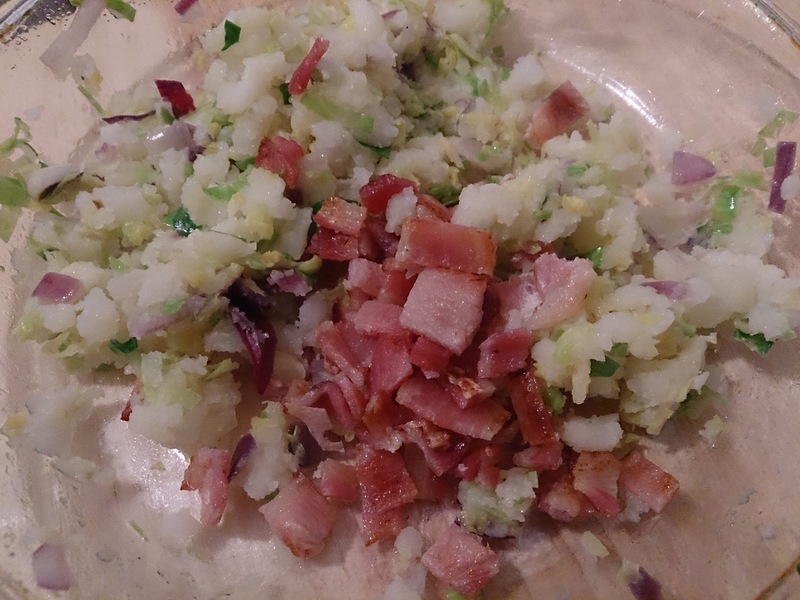 This posting really follows on from an earlier post from this year when I dazzled the world with my deep insights into the world of the potato and Colcannon. 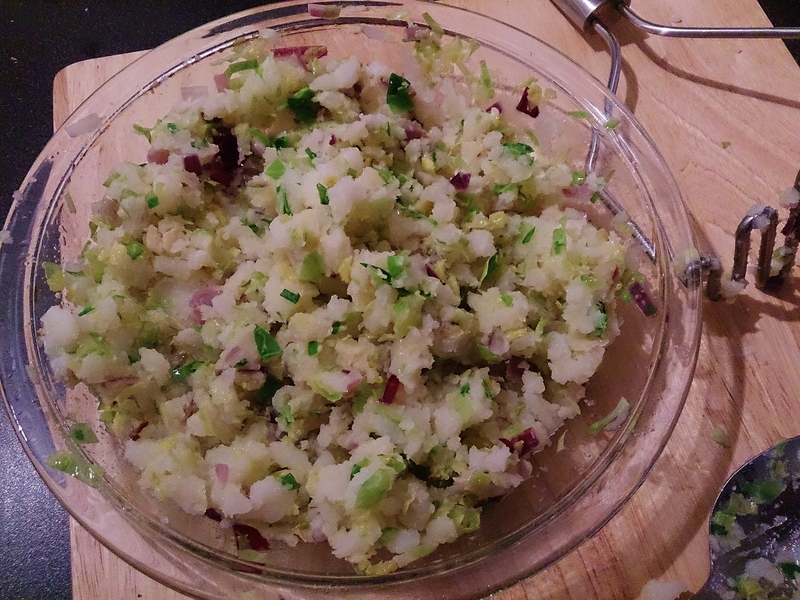 Seeing as a Brussels sprout does seem a little like a mini cabbage then why not use it in a Colcannon? So I tried it and it was brilliant. Then I thought to myself why not go a step further and make it a potato cake? I tried it and it was brilliant. So here we are rapidly approaching the festive season and the inevitable avalanche of Brussels sprouts. So, dear followers, I present to you a possible alternative to plain boiling for your consideration. 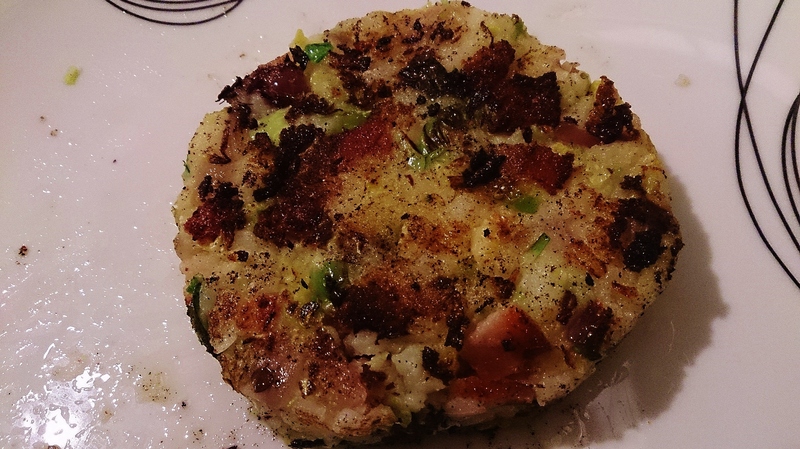 The Brussels ‘Colcannon’ Cake. By the way, I’m not claiming this is the most perfectly worked out dish since the creation of mankind. No doubt, any proper cook stumbling upon this could probably do a lot to improve. 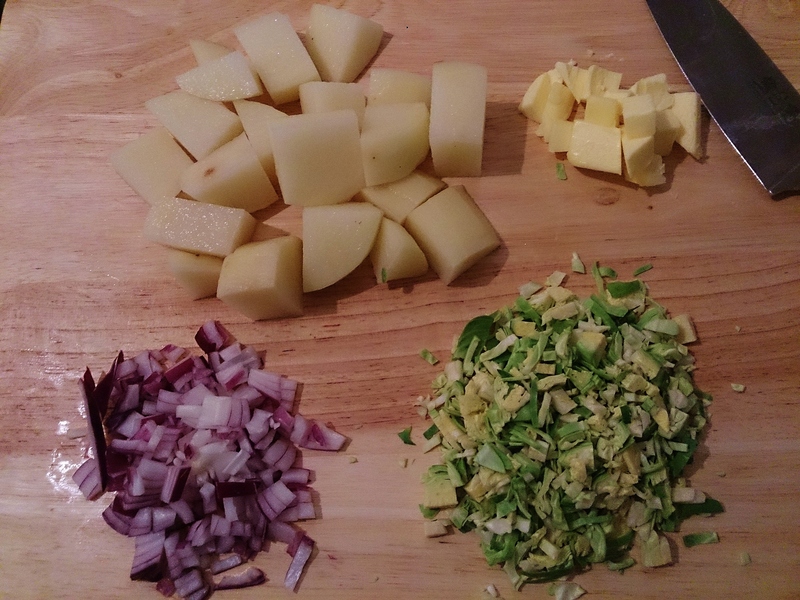 Chop up the ingredients of potato, Brussels sprouts, onion and butter. A fine dice for the onion and Brussels is good. The potato needs to be cooked until soft and the onion and Brussels sprouts need to be softened in a frying pan using the butter. What I really like about this is the colour. As the Brussels soften in the pan they take on a really bright and vibrant green colour. Contrasted with the red of the onion and the white of the potato it really looks the part. Mash it all into the potato. Then comes the tricky part that, I admit, I haven’t properly thought through. That is, turning them in to cakes. This is the tricky bit as they are prone to fall apart. Maybe some beaten egg as a binding would help? Turn the mix into “snowballs”. Form them really tightly just like you would a snowball you are about to throw. Then flatten them slightly whilst maintaining the edge. Add to a frying pan with plenty of hot oil. Fry them vigorously until you judge them to be browning (I can tell by the smell). It only takes a couple of minutes. 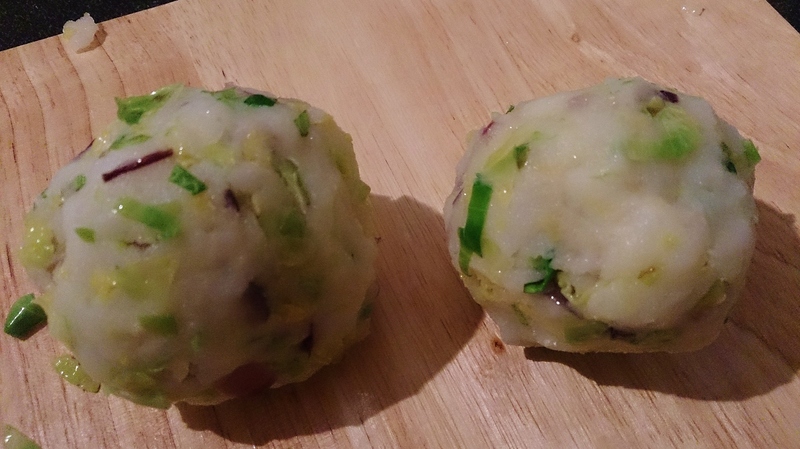 As they cook gently squash and shape them with a fish slice. You may need to do this a few times to avoid breaking them up. You really do have to be very careful and vigilant with this. It is no time to take a phone call. Very carefully turn them over with the fish slice and continue to fry, squash and shape. When you judge the other side cooked (I do it by smell) serve them to a plate. There may well be a better way to do this. I’m open to suggestions. It’s the taste of fried potato that makes this amazing. So how would you use this? Well, serve them with anything you would normally serve plain boiled potatoes and Brussels sprouts with. Now here comes a variation. Add some bacon to the mix. What you end up with is the image at the top of this blog. Trust me, it tastes great. Bacon and Brussels, what a fantastic combination. Imagine this for a Sunday morning breakfast in Autumn or Winter. A Brussels potato cake made with bacon with a poached egg sitting on top. 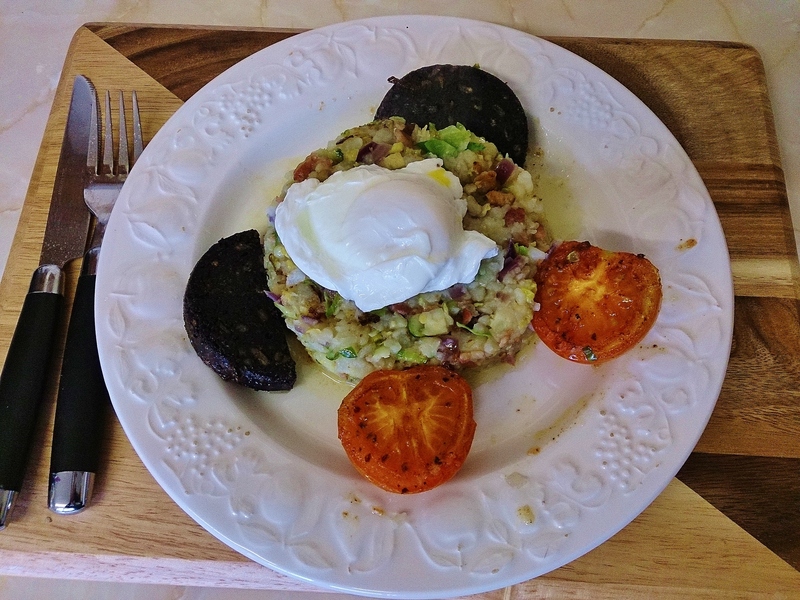 Maybe a lightly fried tomato and a couple of pieces of black pudding around the side. Imagine cutting into the yolk and seeing it run in to the potato cake and down the sides. Wouldn’t something like that just be great?